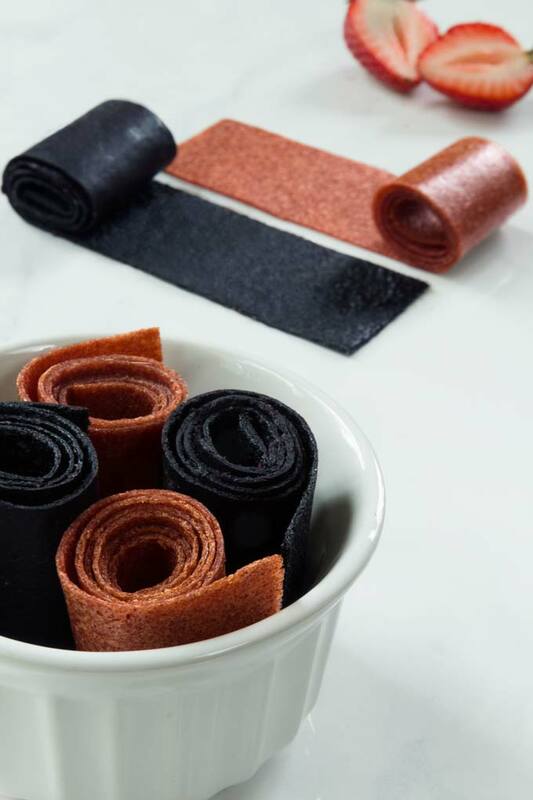 Homemade fruit roll ups are an easy snack to have when you’re on the go or for an extra special lunchbox treat. They are sweet, chewy, and made entirely from fruit. When I was a child, my sister and I would spend our summer holidays at grandma’s. Visiting grandma was fun any time of the year, but summers were the best because she lived on an acreage where she grew all sorts of produce. From root and cruciferous vegetables to leafy greens, apples, apricots, cherries, plums, and my favorite – berries. To preserve all the produce, she would make jams, sauces, salsas, freeze some for future use, AND make fruit roll ups. My personal preference were the classic strawberry and apple fruit roll ups. I remember how impatient I was when the fruit was drying out. Sometimes it took several days because my grandma didn’t use an oven (or a dehydrator). She would dry them in the sun!!! She would take them out early in the morning and bring them back into the house when it got dark. My sister and I would often sample the edges as the fruit leather was drying out and couldn’t wait for the roll ups to be ready! Fortunately, I now own a dehydrator so my fruit roll ups take about 6 hours to make. (If you don’t own a dehydrator, no worries – you can use the oven). 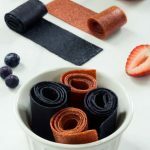 The best thing about making these fruit roll ups at home is that you can use any fruit or a fruit combination you like – strawberries, raspberries, mango, peaches, apricots, apples . . . fresh or frozen. I have never had a bad fruit combo. So play around and see what you like. The texture will be a little bit different with each fruit, but they all work. I used berries because that’s what my daughter requested. (The strawberries I used in this recipe were fresh and the blueberries were frozen). The sweetness is really to your taste. Of course, the sweeter the fruit, the less sweetener you need. For instance, I used much less sweetener with blueberries than with strawberries. My favorite sweetener is maple syrup, but you can use any sweetener you like (liquid or powder). You can also add ground spices and extracts. Just keep in mind that flavors and sweetness intensify after drying, so less is often more. For light-colored fruit, I would also recommend adding lemon juice to keep the colors bright. Personally, I add lemon juice even to dark-colored fruits just to brighten up the flavors. Many recipes for fruit roll ups have you simmer the fruit on the stove first. Well, this recipe is different. You’ll maintain more nutrients if you skip this step and just blend all the fruit into a smooth puree. So that’s what I recommend. If you’re blending fruit with a lot of seeds, such as raspberries or strawberries, you can use a fine mesh strainer (or a nut milk bag) to strain the puree. Personally, I don’t mind the seeds and keep them in for extra fiber. To line the baking sheets, I recommend a silicone mat (silpat). I tried making the roll ups with parchment paper and it works. BUT the final roll ups just don’t look as pretty. The fruit puree is quite runny so the parchment paper soaks up the liquid and crinkles underneath (making the fruit roll ups crinkly as well). A silicone mat, on the other hand, holds its shape perfectly. If you’re using a dehydrator, the dehydrator sheets work just fine. Spread the fruit puree as evenly as possible. An offset spatula works great for this. You’ll want the mixture about 1/8″-1/4″ (3-6 mm) thick. However, I have to warn you that even when you spread the mixture evenly, the edges will still cook faster than the center so try to spread the mixture thicker on the edges. If the edges look like they’re getting crispy, you can cut those off later, or brush them with a little water or juice during the baking process to rehydrate. The most economical way to dry out these fruit roll ups is to use a dehydrator. If you don’t own a dehydrator, set your oven to the lowest temperature possible. It takes about 6-8 hours for the fruit roll ups to dry out at 150°F (65°C). Since the drying process is quite long, fit as many pans in your oven as you can. You can test if the fruit roll ups are done by touching the center. It shouldn’t stick to your finger or indent when you touch it. 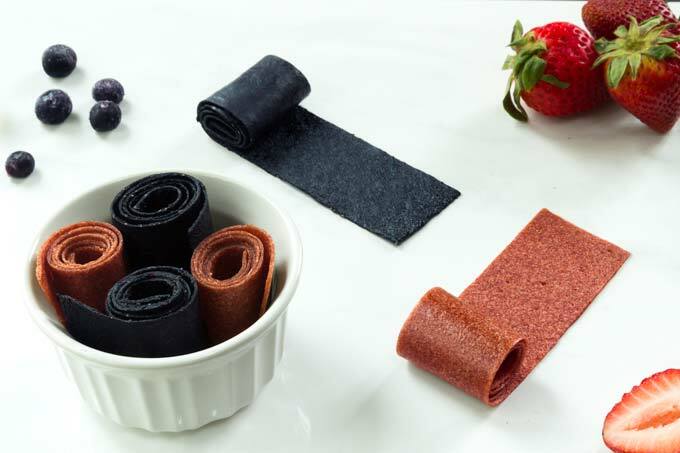 Homemade fruit roll ups are an easy snack to have when you're on the go or for an extra special lunchbox treat. They are sweet, chewy, and made entirely from fruit. 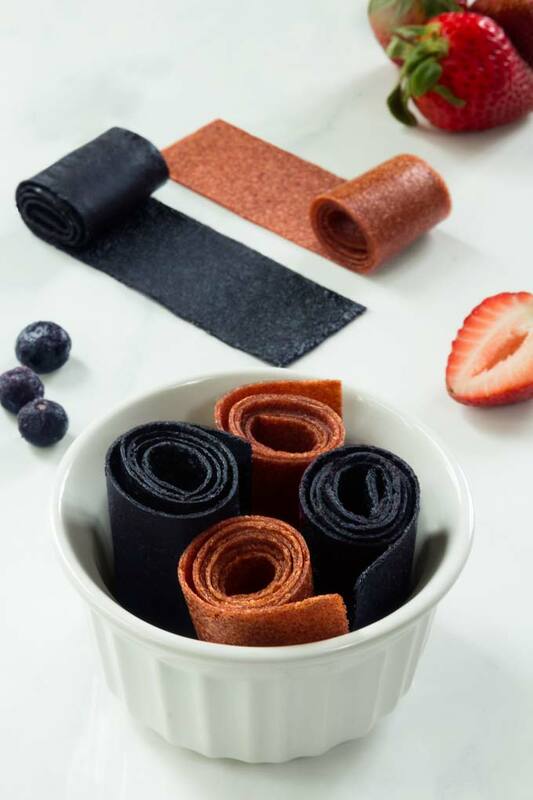 Skip the store-bought fruit snacks in favor of these easy homemade fruit roll ups. Preheat oven to the lowest temperature possible (it will most likely be around 150°F/65°C). Puree all ingredients in a blender until completely smooth. (If you're using seedy fruit, such as raspberries or strawberries, you might want to strain the puree through a nut milk bag or a cheesecloth, but it's not necessary). Pour the mixture onto a baking sheet lined with silicone mat. and spread it evenly into a 1/8″ (3 mm) thick layer. Dehydrate for 6-8 hours or until the center is no longer tacky. If the edges look like they’re getting crispy, you can cut those off later, or brush them with a little water or juice during the baking process to rehydrate. Peel off the silicone mat and cut into strips. Store the strips in a mason jar to stay fresh for several weeks. (If the strips are still a little sticky when you cut them, you might want to wrap them in a piece of plastic wrap (or parchment paper) so they don't stick to each other when you store them). Store leftover fruit roll ups wrapped in an airtight container in a dark cool place for 2-4 weeks. For longer term storage, freeze in an airtight container for up to 3 months.